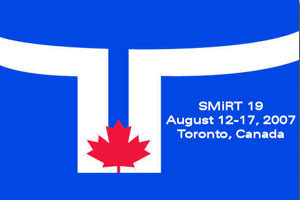 It is a pleasure to welcome you to this 19th International Conference on Structural Mechanics in Reactor Technology, SMiRT 19, which is being held in Toronto, Canada. At the time of the conference, Gen III+ reactors are being licensed and Gen IV reactors are being designed; ESPs are being requested and applications for COLs are being planned; the US NRC has approved recommendations that could potentially reduce the time to conduct reviews of applications for new reactor licenses by between six and fifteen months; Browns Ferry Unit 1 was restarted after a 22 year hiatus; Mitsubishi Heavy Industries has created a new company for fast breeder reactor development after announcing plans to participate in the GNEP program – clearly the renaissance in nuclear energy has begun. We have attempted to bring you Plenary speakers and session topics to address the interests and needs of vendors, utilities, A&Es, academics, regulators and national labs. Our conference theme – Structural Integrity Challenges for the Global Renaissance of Nuclear Power – reinforces the central idea that structural integrity underlies and permeates every aspect of the nuclear power enterprise from new reactor design, construction and manufacturing, O&M, and decommissioning. This CD contains the program and papers available at the time of publication. Presentations from the Opening Ceremonies and the Plenary Sessions will be available on the IASMiRT web site (www.iasmirt.org). I trust that you will find the papers from this conference to be a valuable resource. Papers from many of the earlier conferences are posted on the IASMiRT web site just referred to, and they show the progression of innovative ideas in structural mechanics in reactor technology from the earliest conference in 1971. This trend will continue at SMiRT 20 which will be held in Finland in 2009. Let me be the first to encourage you to attend and participate in that conference!